Join the discussion on our forums! Come discuss Volatile Elemental over in our dedicated Volatile Elemental discussion topic. Deathrattle: Deal 3 damage to a random enemy minion. Currently in an anger management class with Raging Worgen, Grommash Hellscream, and The Angry Chicken. It isn't helping. I think people are under evaluating this card. So far weve seen some 1 mana 1 HP minions released in this expansion. So there will be situations where this card kills a 1 drop and another 3 hp minion - all in early game. Say even your opponent had 2 drop, you played this. They played 3 drop with lets say even 5 hp. Spit from Elemental dealt 3 dmg to his 3 drop. Now his board is ultra vulrneable to AOE. Overall i tihnk its great anti aggro/midrange card. AND its elemental. Will definately see some play. Maybe even replace Doomsayer in hard control elemental decks. Agreed, It's a bit like a doomsayer. And you can curve into turn 3 elemental or thunder lizard. making you ahead on the board. art looks dope. imagine golden! The art was updated and isn't as blurry. It looks awesome! 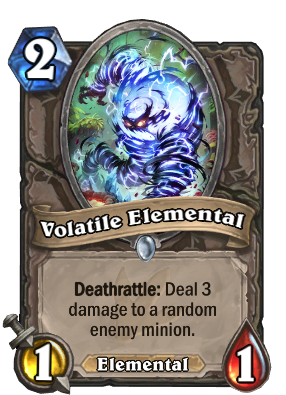 Volatile Elemental Flamewreathed Faceless Volatile Elemental = standard Dr Boom. Really he meant, Fire Plume, Fire Plume, Volatile, Volatile, Faceless = 5 mana. LOL 2 mana boom bot. LOL. Dr Balanced confirmed balanced. Get a 6 drop + two 2 drops for 7 mana ? Yeah right. I was just thinking it'd be cool if we had more cheap, early game RNG cards that have really swingy effects.